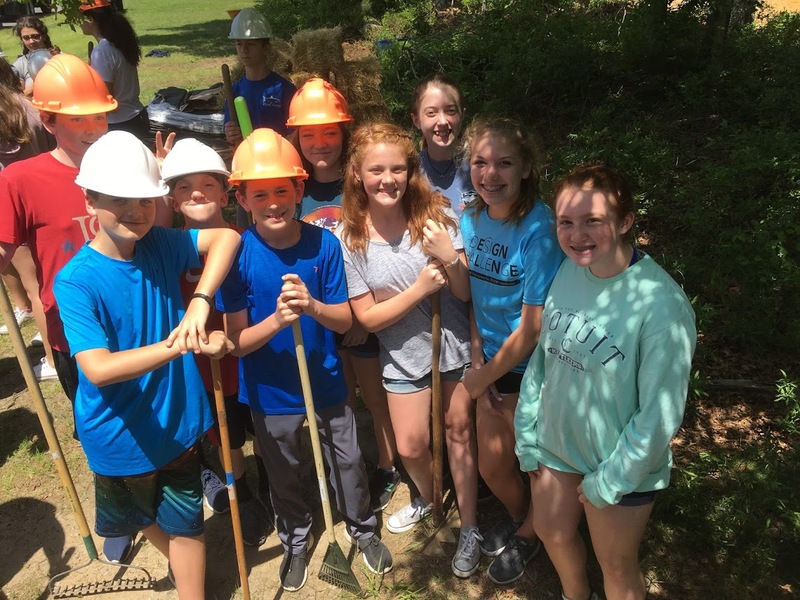 On June 8, 2018 the STEM Academy and Sandwich High School constructed a vernal pool, and created a rich outdoor living laboratory. This wetland habitat was created, thanks to an $7,500 grant Mass Audubon’s Long Pasture Wildlife Sanctuary (LPWS) received from The Horizon Foundation. STEM science teachers, Amy Ferreira, Renee Fudala, and Betty Hyde-McGuire worked with Ian Ives, Sanctuary Director at LPWS, to make this exciting project come to fruition. The vernal pool at the STEM Academy is the 7th wetland to be constructed on school grounds on Cape Cod. 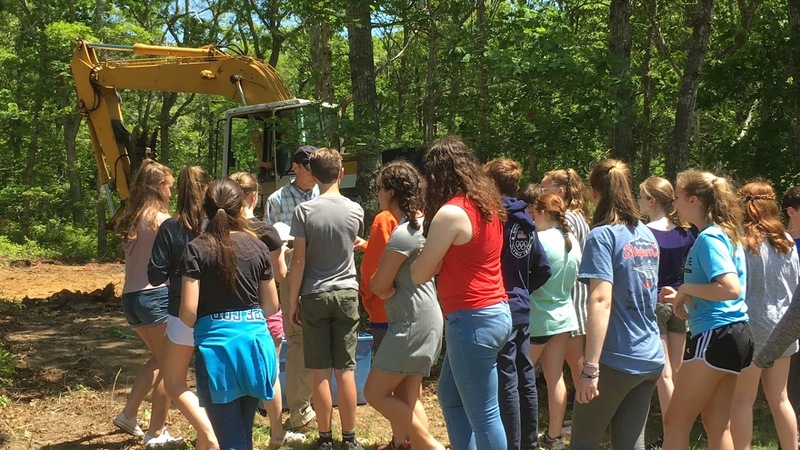 In the last two years, Falmouth High School, Lawrence Middle School in Falmouth, Monomoy Regional Middle School, Cape Cod Academy and Falmouth Academy have all received new wetlands. This year both the STEM Academy and Barnstable High School constructed one. The wetland was built using the techniques described in the book by Thomas R. Biebighauser Wetland Restoration and Construction – A Technical Guide. The wetland will appear natural and will require no maintenance. Ian Ives and Tom Biebighauser, a wetland scientist, acted as consultants and assisted in project design and planning. They were on site on construction day to guide students and school staff. Students were engaged in a real life ecological engineering project. Wetlands provide great opportunities for outdoor learning. Students can learn about science, mathematics, engineering, history, and art by experiencing lessons firsthand at a wetland. 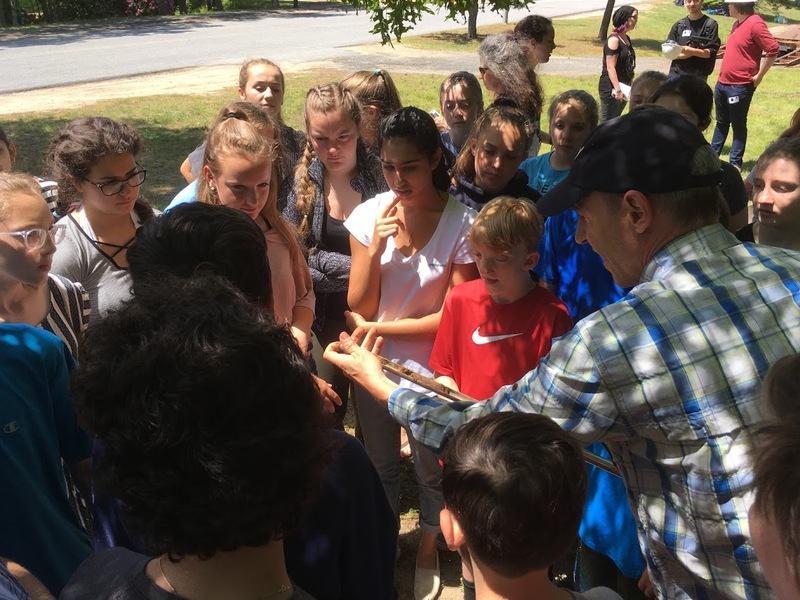 Adding a wetland to STEM will provide students with unparalleled opportunities to investigate animals, plants, soils, and water chemistry, and ecological succession in an ecosystem that is uncommon on Cape Cod. Students were introduced to the project and wetland ecology through an in school presentation provided by Mass Audubon in March 2018. By creating a wetland on campus, students will have the opportunity to compare and contrast biodiversity, colonization rates, hydrology and animal and plant composition among this newly created wetland and an existing naturally occurring wetland on campus. In addition, more wetlands means more rare species habitat resulting in conservation biology, stewardship, and protection of rare ecosystems on Cape Cod. Over 170 students come out to help with the verbal pool construction and over 30 stayed after school to help. It was an incredible team effor by the adults and kids of STEM Academy, and the possibilities for learning are endless! Enjoy the pictures and video – 9 hours of work edited into a fun 2 minute video!